Economist Zubair Iqbal explains the daunting economic challenges facing Arab countries in transition following the Arab Awakening and the different trajectories stemming from those nations' policy responses. Tunisia and Egypt provide an instructive case study: the former made hard fiscal decisions and has embraced sound economic principles and achieved broad support for a reform plan, while the latter, suffering from more difficult political conditions, has been faced with limited policy options that increase the risk for long-term challenges. Drawing from these examples, there are three essential steps that other Arab countries should take to heart to help ease their transition: 1) Craft a comprehensive economic reform program clearly identifying the path, sequencing, and pace of adjustment to achieve concrete objectives, 2) Build political consensus and forge a strong constituency for economic reform, and 3) Create and foster institutions to implement reforms in a transparent and unbiased fashion. Broad political consensus on a reform strategy that is supported by a strong constituency of stakeholders is needed. Without such consensus, it is difficult to address the conflicting objectives of macroeconomic stabilization with political demands for higher subsidies, employment opportunities, and accelerated growth. Negotiations among major stakeholders on an economic strategy need to be country-specific and must clearly lay down the costs and benefits of policy actions needed for implementation. Efforts at macroeconomic consolidation may have to be moderated in order to allow greater early attempts at meeting socially critical demands for selective subsidies and employment opportunities, which would help the much-needed sociopolitical transition. The adjustment process could also be stretched over a longer period. Orderly transition over a longer period would call for adequate external financial support conditioned on adjustment measures under a reform program for the restoration of macroeconomic stability and resumption of self-sustaining growth. Steps must be initiated to undertake structural reforms to pave the way for efficient and productive private sector investment. Foundations for economic forces that contributed to the recent political upheaval in the ACTs were laid over the past several decades. Until the 1990s, confronted with limited economic resources and rapidly growing populations, governments in many of these countries pursued policies that were aimed at securing their monarchical and autocratic control. In particular, they established a dominant public sector that controlled private sector activities and allocated resources to secure their hegemonic grip on the economy and the state. Macroeconomic policies—including fiscal, monetary, and exchange rate—were used to mop up the bulk of domestic savings to finance public sector expenditures. These included subsidization of some basic needs such as food and energy to ensure relative income equality and help secure support for the existing political order. While external official assistance and inflows of workers’ remittances from oil exporting countries filled the resource gaps, the widespread restrictions on resource allocation and subsidies did not allow self-sustaining growth to take hold. In the 1990s, two important developments—the end of the Cold War and the increasing rate of globalization—made the existing model of governance less effective. Official external financing shrank, it became easier for capital to migrate abroad in response to better returns, and weak competitiveness arising out of past policies adversely affected exports. At the same time, growth of workers’ remittances as a percent of GDP moderated. These factors led to a widening of fiscal and external imbalances, slower growth, rising unemployment, and unabated inflationary pressures. These developments led to the first round of political unrest. Many non-oil Arab economies responded to these challenges by tightening macroeconomic policies and obtaining financial support from the IMF, in return for which some countries’ exchange rates were adjusted and credit controls were eased along with more market-determined interest rates. Privatization of the public sector was initiated while private sector investment was promoted, including through an increase in implicit and explicit subsidies for energy and credit—which, paradoxically, negatively impacted income distribution. However, few concrete steps were taken to address longstanding structural distortions: little was done to generate human capital, productivity and wages stagnated, financial sectors remained inefficient and heavily controlled, and pricing of factors of production continued to be largely immune to market forces. Even though trade liberalization agreements were signed with major trading partners, import restrictions were maintained to provide protected markets for the subsidized private sector. Thus, even though growth picked up during the early part of the last decade, underlying structural vulnerabilities increased. The emerging economic structure neither established a sound basis for sustainable growth nor created more employment opportunities, but—very significantly—widened income inequality as real wages increased little. Real per capita GDP growth remained lower than in other emerging market economies. Private sector firms, on the other hand, benefited from special government privileges, protection, subsidies, and monopoly rights. These developments heightened political tensions. Slowdown of global demand following the financial crisis of 2008-2010 further weakened the economic situation in the region. Economic growth in the ACTs declined, unemployment increased, and income inequality worsened. In the absence of political and civil society institutions that could have helped respond to public dissatisfaction with the status quo, popular uprisings became inevitable. It is, however, important to stress that while economic factors were a necessary condition for the popular uprisings, they were not a sufficient condition; the absence of political and civil society institutions was a critical precondition for violent change in response to economic deprivation. More established institutions that give voice to popular discontent mean less violent change in the political order and more orderly economic reforms. The economic impact of political dislocation and the associated rising social pressures for change in governance have been deep and significant. The resulting deterioration in security, disruption in normal economic activity, and drop in market confidence has had a severe impact on ACTs. Combined with the continued global economic slump, these factors have led to a sharp slowdown in economic activity and rise in unemployment while inflation has remained high. Growth rates fell from an average of over 5 percent in 2010 to less than 2 percent in 2011 and 2012. This, of course, masks significant variations in country experience; while Yemen and Tunisia experienced economic contractions along with Libya, growth rates in Egypt and Jordan fell by two-thirds and Morocco experienced a modest increase. Although remittance inflows remained stable, some countries—especially Egypt— experienced significant capital flight in light of economic uncertainty under unchanged exchange rates, which sharply increased external resource gaps. Concurrently, fiscal deficits rose sharply as public sector wages and government subsidies were increased in response to social pressures. In a number of countries, particularly Egypt, increased borrowing and a loss of external reserves eroded protection against domestic and external shocks. Following political change, ACTs have been confronted with conflicting objectives: the need to tighten macroeconomic policies to reduce the ballooning fiscal and external imbalances, along with the need to raise government expenditures to meet popular demands for employment opportunities and higher wages. On top of this, these countries are confronted with longer-term structural distortions that had inhibited growth and employment. All of the ACTs have struggled to reconcile these conflicting objectives. Initial attempts to restore macroeconomic stability have met with mixed results as government expenditures have been increased for subsidies and employment generation. Fiscal and external deficits have worsened, inflation has remained high, and external reserves have fallen further. The financing gaps have increased without any meaningful diminution of social challenges while vulnerabilities to domestic and external shocks have intensified. The long-term structural impediments have remained unaddressed. More decisive efforts at reform have been stymied by the inability of countries to develop institutions and political conditions needed to generate popular support for the difficult—and initially painful—reform measures. Divergent stakeholder interests and the associated deepening political conflicts within countries, as in Egypt, have further weakened the resolve for reform. Also, regional developments, including the civil war in Syria and unrest in Libya and Iraq, have had debilitating spillover effects on neighboring countries. In the process, political risks and social unrest have grown, negatively impacting ACTs’ ability to strengthen economic management. At the same time, the global economic recovery has been too sluggish to significantly benefit the region. In 2013, growth remained too low to generate jobs that would stem rising unemployment—the number of unemployed has on the contrary increased by more than a million since 2010. The near and medium term outlook remains grim. Notwithstanding similar economic and social challenges, countries have responded differently. The contrast is particularly evident in the case of Egypt and Tunisia. At the onset of political revolt in 2011, both countries had similar political structures. They had been growing briskly with manageable fiscal and external imbalances, which masked the deepening income inequality, rising unemployment, and marginalization of large segments of their societies. The subsequent economic dislocation and political uncertainty led both to a dramatic drop in growth and a rise in fiscal and external deficits. Unemployment rose to about 14 percent in the two countries while a rise in inflation was initially held back only by the rise in subsidies. Experience in East Asia and Eastern Europe shows that a successful transition following political change requires three basic inputs: a clearly defined economic strategy, the existence or creation of a broad-based constituency of stakeholders in support of the strategy, and institutional capacity and political commitment to implement the strategy. Since the strategy would inevitably reallocate benefits and costs between labor and capital, poor and rich, political interest groups, and different sectors of the economy, a buy-in by all stakeholders into the path of adjustment is critical for success. At the same time, institutions and legal structures (including a constitution) must exist or be created to ensure that the constituency for reform is preserved in the face of changes in benefits. The effectiveness and viability of policy responses in Egypt and Tunisia should be assessed on the basis of their role in establishing a feasible strategy for reform, creating a constituency in support of the strategy, and developing institutions—legal, political, and administrative—to implement the strategy in a transparent fashion. Both countries recognized that restoration of macroeconomic stability in the short run must facilitate the difficult task of quickly delivering on expectations for jobs and growth. However, they diverged in their approaches, particularly in terms of creating institutions for implementing reforms and bringing diverse stakeholders together. Torn between macroeconomic stabilization and demands for easing poverty and unemployment and unable to work out a consensus with various stakeholders, the new Egyptian authorities in 2011-12 chose to accord more importance to addressing the latter. They decided against an arrangement with the IMF that would have provided an autonomous restraint on the expansionary policies that underlie the large fiscal and external deficits. The much-needed fiscal consolidation was abandoned, allowing a sharp increase in public sector wages, pensions, and subsidies. With revenues not keeping pace with spending on account of the economic slowdown, the fiscal deficit was allowed to increase to about 11 percent of GDP. Although steps were taken in 2012-13 to curtail subsidies and restrain growth in wages, the deficit is estimated to have worsened dramatically to over 14 percent of GDP. In the process, public debt increased to about 90 percent of GDP, dramatically increasing financing challenges for the period ahead. This development also weakened the effectiveness of monetary policy to control inflation, crowded out credit to the private sector, and, with a fixed exchange rate, drained external reserves to dangerous levels. The military ouster in 2013 has potentially created new challenges. The evolving political polarization and dissent will likely make it even more difficult to implement unpopular but necessary macroeconomic reforms. The financial support from Kuwait, Saudi Arabia, and the UAE (about $12-15 billion) has weakened resolve for tighter policies. In the absence of a clearly articulated strategy, the authorities are currently implementing a stimulus package (the equivalent of $4 billion) financed by this support to promote growth and employment. There are plans to implement another stimulus package of about the same magnitude in the second half of the 2013/14 fiscal year. However, these initiatives could fall short of expectations because of the pre-existing disruptions in the manufacturing and tourism sectors and other market distortions. They could also raise the downwardly rigid public expenditure to a level that would widen the resource gap in the event of lower financial inflows. In the absence of broad political consensus and diverging interests of stakeholders, it would be difficult to expeditiously reduce subsidies, rationalize and consolidate expenditure, and reform the tax system in order to reduce the fiscal deficit. It would also be difficult to steady the foreign exchange market, reduce uncertainty, and undertake structural reforms that are needed to improve competitiveness and facilitate sustainable growth. Egypt could also find it politically difficult to adjust to a reduced resource envelope if financial support from donor countries is reduced or ceases. Any subsequent increase in public debt would make economic challenges more daunting. Finally, any heightened political uncertainty or renewed violence could further weaken confidence and spur capital flight, eroding external reserves. Creating a viable constituency of stakeholders for sustained reforms has turned out to be more difficult than expected. In contrast to Egypt, Tunisia chose to pursue wide-ranging economic reforms despite serious political pressures. 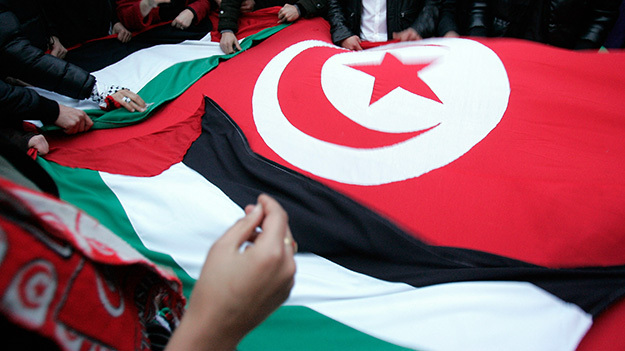 The Tunisian economy encountered serious strains in 2011-12 from slower external demand and a worsening fiscal position due to a higher wage bill and rising subsidies in response to post-revolution social pressures. Higher spending and rising global prices for food and fuel also pushed up inflation and contributed to a rise in external and fiscal deficits. Unemployment remained high in an uncertain external environment and a shifting domestic political scene. The Tunisian authorities started implementing a comprehensive economic program in 2012-13 that contains three broad sets of policies. The first aims at macroeconomic stabilization, primarily through fiscal correction including reform of subsidy policy, supported by increased exchange rate flexibility. The second set expects to establish foundations for more inclusive growth through a greater role for private sector investment and reform of the financial sector to reduce its vulnerabilities. The third set aims to establish a better safety net to protect the most vulnerable groups while promoting regional equality. Reduction and restructuring of government spending would create fiscal space for investment to accelerate growth and employment opportunities. The program is supported by a financial arrangement with the IMF of $1.75 billion over a two-year period. It is to be expected that implementation of the program will catalyze additional multilateral and bilateral financial support to ensure progress toward sustained growth with equity. The authorities have taken steps to reduce subsidies on energy and fuel while targeting poor and vulnerable groups through a social safety net. In the process, government expenditures are being redirected to more productive activities. In addition, new taxes will be imposed on goods consumed by the relatively wealthy, partly as a means for financing subsidies to the poor. After rising in 2013, the fiscal deficit should start to decline if the planned fiscal measures are implemented fully. Concurrently, greater exchange rate flexibility has absorbed some of the financial pressures and should help improve the external position in the period ahead. It is expected that improvements in the fiscal position (including strengthened revenue collection) would facilitate more bank credit—“crowding in”—to the private sector. If fully implemented, the economic strategy could continue to hold public debt below 50 percent of GDP, thus easing financing pressures in the medium term. Implementation of the economic reform agenda enjoys broad political support. Institutions such as the trade unions as well as religious and secular groups have played a constructive role. The recent approval of a broad-based constitution is an important milestone toward this endeavor. This, combined with a new technocratic government, would allow more cohesive policy formulation and implementation of the official reform program. Notwithstanding political difficulties, Tunisian authorities have been able to meet commitments for reform under the IMF program. Continued IMF support for the program would, by endorsing confidence in the underlying program and the government’s commitment to it, also facilitate bilateral and multilateral financial support. However, the reform effort has been constrained by a number of exogenous and endogenous shocks. The protracted political negotiations and related uncertainty have delayed some of the reforms. Other ACTs, excluding Libya, have experienced steady reforms. In particular, Jordan and Morocco, whose adjustment efforts are supported by arrangements with the IMF, have tightened fiscal policies and eased external pressures. This process has been facilitated by stronger political and civil society institutions that allowed consensus on economic objectives and policies. Relatively less challenging pre-existing economic conditions and increased external financing have also helped the reform process. Nonetheless, there are important lessons from the experience of Egypt and Tunisia that can be drawn upon by ACTs as well as other Arab countries to ease the transition process. It should, however, be recognized that the economic outlook is weakening for ACTs and the burden of adjustment will increase in the period ahead. First and foremost, the importance of political consensus building and the creation of a strong constituency for economic reform cannot be overemphasized. In the absence of broad support for such difficult reforms, concessions will have to be granted to “buy” stakeholders. Such a strategy will not allow the much-needed reduction and redirection of government expenditures that is essential for addressing macroeconomic imbalances, improving income distribution, and laying down foundations for “inclusive” and sustained growth to reduce unemployment. Second, institutions—both political and administrative—must be created (or nurtured) to implement reforms in a transparent and unbiased fashion so that the newly established “social contract” is honored and secured. This will entail, at a minimum, the adoption of or adherence to a popularly accepted constitution. It is important that the various stakeholders view the institutional structure, especially the judiciary, the security apparatus, and administrative machinery, as fair in resolving disputes and implementing reforms. Third, a comprehensive economic reform program—with broad public support— should be crafted and implemented. It should clearly identify the path, sequencing, and pace of adjustment to achieve often-conflicting objectives. The program should identify the costs and benefits for the stakeholders and sources of financing for the adjustment process. Given the experiences so far, there may be merit in a better balancing of expenditure restraint and the creation of employment opportunities. Continued popular support for adjustment will be better secured if the pace of reduction in such expenditure is more gradual. This will require greater external financing (rather than domestic bank financing) over a longer period. However, it is critical that such financing is conditional on well-defined prior policy actions by beneficiary countries to ensure maximum long-term benefits to the economy. The reform strategy must address impediments to efficient private sector investment through the generation of needed human capital, regulatory and market reforms, and the public-private sector nexus, so that resource allocation reflects market-determined prices rather than state-sponsored protectionism, subsidies, and monopolies. Deepening economic integration with other Arab countries should also help the reform process. Finally, the international community should play a constructive role by helping the ACTs to adhere to their adjustment strategies. It would be counterproductive to provide unconditional assistance that would increase dependence without creating self-reliance and self-sustaining growth. Ideally, such assistance should be pooled in a trust fund that would release resources subject to the needed policy actions in the beneficiary countries over a well-defined period. The ACTs must recognize that since such extraordinary assistance will not be available over an extended period, macroeconomic tightening will need to be prioritized. Foreign direct investment could increase and replace such official assistance as security conditions improve, political consensus solidifies, and market forces become more effective in allocating resources.